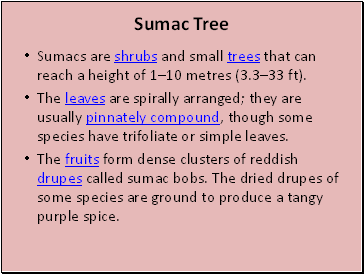 Sumacs are shrubs and small trees that can reach a height of 1–10 metres (3.3–33 ft). The leaves are spirally arranged; they are usually pinnately compound, though some species have trifoliate or simple leaves. The fruits form dense clusters of reddish drupes called sumac bobs. The dried drupes of some species are ground to produce a tangy purple spice. 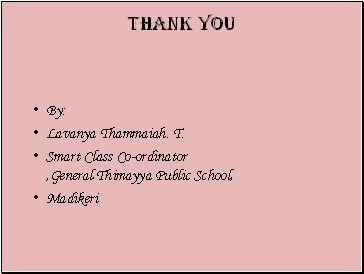 The flowers are in dense panicles or spikes 5–30 centimetres (2.0–12 in) long, each flower very small, greenish, creamy white or red, with five petals. 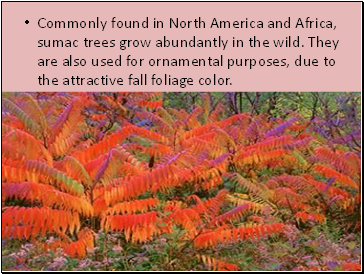 Commonly found in North America and Africa, sumac trees grow abundantly in the wild. 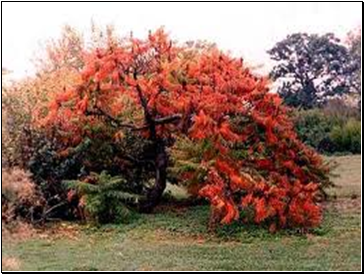 They are also used for ornamental purposes, due to the attractive fall foliage color. 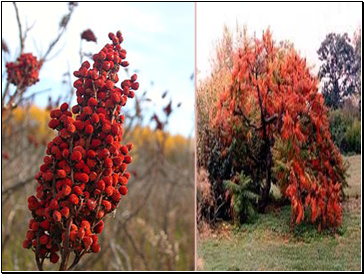 There are approximately 250 species of flowering plants that are known by the name sumac. 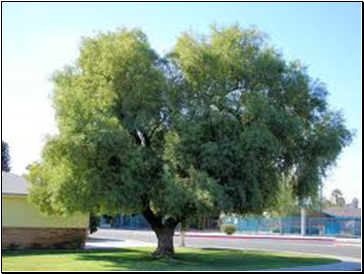 They are used for various purposes besides being an ideal tree for landscaping. 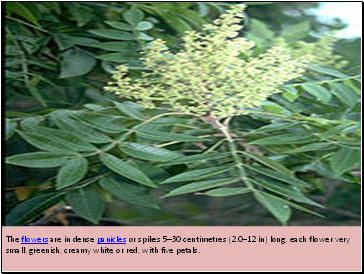 However, the popularity of the sumac tree is somewhat marred by some toxic species, which can cause severe skin irritation and rash, if touched. 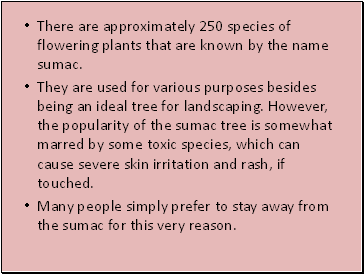 Many people simply prefer to stay away from the sumac for this very reason. 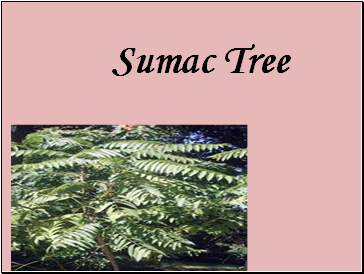 Sumac trees are usually easy to prune and care for, due to their small size. The plant requires minimal care and maintenance. Besides this, the plant with its brilliant fall foliage can truly enhance the look of a landscape. 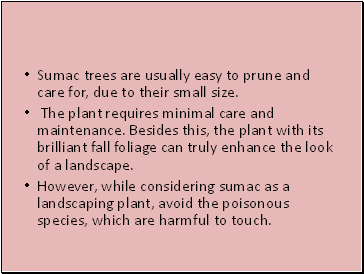 However, while considering sumac as a landscaping plant, avoid the poisonous species, which are harmful to touch. 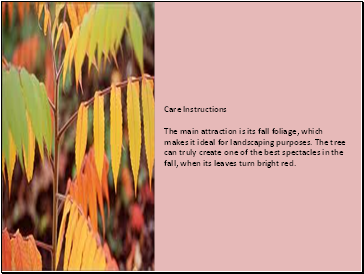 Care Instructions The main attraction is its fall foliage, which makes it ideal for landscaping purposes. The tree can truly create one of the best spectacles in the fall, when its leaves turn bright red.